Zoologists are biologists who study a variety of animal species. Those studies can include researching animal behaviors and characteristics, and how they interact with their ecosystems. Zoologists may be involved in research, animal management, or education. Zoologists may specialize in a branch of the field that is concerned with a related group of animals, such as mammalogy (mammals), herpetology (reptiles), ichthyology (fish), or ornithology (birds). Zoologists may also specialize even further by concentrating on the study of a single species. Zoologists often work in conjunction with zookeepers, veterinarians, marine biologists, and wildlife biologists to properly manage animal populations in captivity and in the wild. Zoologists may also take on keeper and curator roles in some zoological parks. 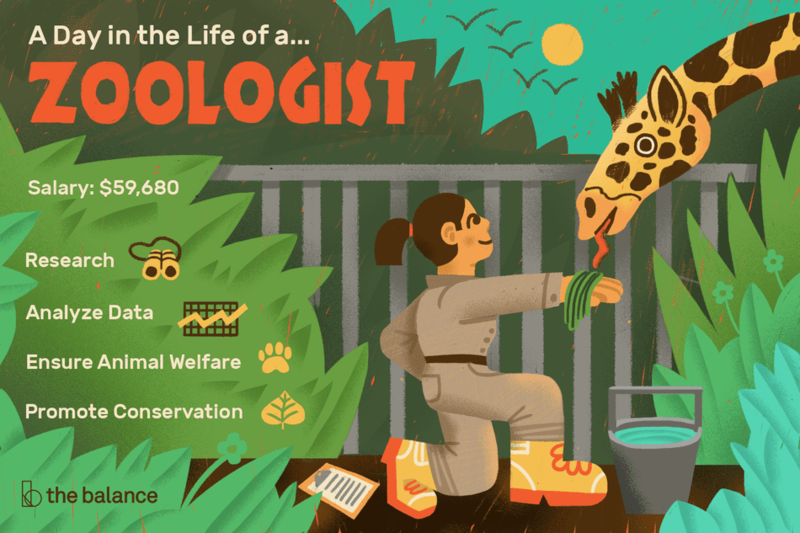 The salary for zoologists may vary based on factors such as the type of employment, level of education completed, and duties required by their specific position. Zoologists with graduate degrees or with specialized knowledge tend to earn higher salaries in the field. Zoologists must have at least a bachelor's degree to enter the profession. Graduate-level degrees, such as a master's or a Ph.D., are generally preferred and often required for advanced research or teaching positions. The major for an aspiring zoologist is usually biology, zoology, or a closely related field. Many undergraduates earn their initial bachelor's degree in biology before focusing on zoology during their graduate-level studies. Courses in biology, anatomy and physiology, chemistry, physics, statistics, communications, and computer technology are required for the pursuit of any degree in the biological sciences. Zoologists may also need to take additional courses in animal science, veterinary science, animal behavior, animal husbandry, and ecology to complete their degree requirements. Communication skills: Zoologists must be able to write effective research papers and reports. They also need to communicate verbally and in writing with the public, policymakers, and other stakeholders. Observation skills: It's critical to notice slight changes in an animal’s behavior or appearance and observe a variety of elements in animals' surroundings. Critical-thinking skills: Zoologists must be able to draw conclusions from experiments, research results, and scientific observations. Problem-solving abilities: Zoologists must find solutions to help protect animals and wildlife from possible threats. Comfort with technology: Being tech savvy is a plus because zoologists often use highly specialized scientific equipment and data management software during the course of their research activities. The Bureau of Labor Statistics projects that employment for wildlife biologists and zoologists will grow slightly more than the average, at 8 percent through the year 2026 compared to 7 percent for all occupations. Zoologists holding graduate degrees will have the greatest number of career options, especially in research and academia. Zoologists may face strong competition for jobs. Becoming a member of a professional association can give candidates an advantage. Association of Zoos & Aquariums: The AZA is one of the most prominent membership groups for zoologists and other zoo professionals. AZA members are a network of thousands of committed zoo and aquarium professionals, organizations, and suppliers worldwide. The organization offers associate and professional membership levels. Zoological Association of America: The ZAA is another professional group open to zoologists. This association also offers associate and professional levels of membership. American Association of Zoo Keepers: Zoologists may also choose to join the AAZK, a widely known group that has been active in the profession since 1967. The AAZK is not just for zookeepers, though; membership includes all levels of zoo personnel, from keepers to curators to veterinarians. Employment opportunities for zoologists are present with zoological parks, aquariums, marine parks, state or federal governmental agencies, laboratories, educational institutions, museums, publications, environmental conservation groups, and consulting companies. Enjoying the outdoors is a must for this career path. Zoologists may work outdoors in varying weather conditions and extreme temperatures while conducting research or management activities. Most zoologists work full-time, and they may work long or irregular hours, especially when working in the field. Look at the top zoo internships around the country and choose one that's right for you. Joining an organization such as the Association of Zoos & Aquariums, Zoological Association of America, or American Association of Zoo Keepers can give you a competitive advantage. ﻿Organizations such as the AZA post job opportunities that are specific to the field of zoology.